Currently, the recommended treatment for menopausal symptoms is the shortest regimen 1and lowest possible dosage of postmenopausal hormone therapy. The estimated minimum dosage of estrogen necessary to preserve bone mass is based on studies of young women who have undergone oophorectomy. However, these estimates may be too high for postmenopausal women, because even low levels (i.e., less than 20 pg per mL [70 pmol per L]) of endogenous plasma estradiol (Estraderm) can increase bone density and reduce fracture risk in this group. 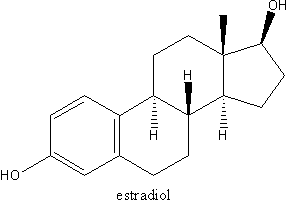 Ettinger and colleagues studied the effect of an ultralow dosage (0.014 mg per day) of transdermal estradiol on bone density and endometrial hyperplasia in postmenopausal women. This randomized, double-blind, placebo-controlled trial was conducted at nine clinical centers in the United States. The 600 women who participated in the trial were 60 to 80 years of age, had a uterus, and were at least five years past menopause. Normal bone mineral density (BMD) was required, but women who used antiosteoporosis medications or had undergone recent hormone therapy were excluded. Patients were required to have fasting triglyceride levels of 300 mg per dL (3.39 mmol per L) or less and fasting glucose levels of 180 mg per dL (10 mmol per L) or less. Patients also were excluded if they had endometrial hyperplasia; unexplained uterine bleeding; abnormal mammography results; or a history of metabolic bone disease, stroke, transient ischemic attack, venous thromboembolism, or liver or thyroid disease. The intake assessment included breast and pelvic examinations, Papanicolaou smear, endometrial aspiration sampling, mammography, BMD assessment of the lumbar spine and hip, and extensive laboratory testing. Data on the patient's medical history, health habits, and medication use also were gathered. After intake assessment, 209 patients were randomized to receive placebo and 208 patients were randomized to receive an estradiol patch in a dosage of 0.014 mg per day for two years. All patients received daily calcium and vitamin D supplements. The authors assessed adverse effects and compliance at four-month follow-up visits, and endometrial biopsies were attempted annually. The primary outcomes were endometrial hyperplasia and change in lumbar spine BMD at two years. Secondary outcomes included incidence of fractures and biochemical markers of bone turnover. After randomization, the only significant difference between the groups was in BMD measurements. At baseline, BMD in the lumbar spine was about 2 percent lower in the treatment group than in the placebo group. After one year, BMD in the lumbar spine increased by 2.1 percent in the treatment group and by 0.5 percent in the placebo group. Differences also were significant in total hip BMD and in biochemical markers of bone metabolism. Mean total hip BMD increased in the treatment group and decreased in the placebo group. Differences remained significant at year 2. Differences in BMD were even greater for lumbar spine and total hip after the results were analyzed by intention to treat. Ten women in the placebo group and four in the treatment group had clinical fractures during the study (P = .17). Mean plasma estradiol levels increased significantly in the treatment group but were unchanged in the placebo group. Serious adverse events such as cancer, hospitalization, and death occurred with equal frequency in both groups. Three patients in the treatment group were diagnosed with endometrial polyps compared with two patients in the placebo group. One patient in the treatment group developed uterine adenosarcoma and one had focal atypical hyperplasia. Three patients in the treatment group and five in the placebo group had abnormal mammography results. One woman in the treatment group and two in the placebo group developed breast cancer. The study was completed by 376 patients (191 in the treatment group and 185 in the placebo group). The authors conclude that ultralow-dose transdermal estradiol therapy successfully improves BMD without increasing endometrial hyperplasia or inducing breast pathology in postmenopausal women. They advocate redefining estrogen "deficiency" in this age group to levels closer to 5 to 10 pg per mL (20 to 40 pmol per L) instead of the 50 to 200 pg per mL (180 to 730 pmol per L) recommended for premenopausal women. Ettinger B, et al. Effects of ultralow-dose transdermal estradiol on bone mineral density: a randomized clinical trial. Obstet Gynecol September 2004;104:443-51. EDITOR'S NOTE: This study contributes to the growing debate over the risks and benefits of hormone treatment in postmenopausal women. Previous studies, including the Women's Health Initiative, have found that the risks of even low-dose hormone therapy outweigh the benefits in postmenopausal women, making additional large, long-term studies necessary. Such trials would need to monitor a much wider spectrum of outcomes than did the study by Ettinger and colleagues, including cardiac, cerebrovascular, and thromboembolic diseases; and reproductive, colon, and other cancers. They also would need to include women who had undergone hysterectomy. Given the consequences of the Women's Health Initiative and related studies, would a new round of studies of low-dose therapy be ethically acceptable? Would sufficient numbers of women be willing to enroll in such studies to generate the statistical power needed for results on which we can reliably base these crucial decisions?--A.D.W. (1.) Writing Group for the Women's Health Initiative Investigators. Risks and benefits of estrogen plus progestin in healthy postmenopausal women: principal results from the Women's Health Initiative randomized controlled trial. JAMA 2002;288:321-33.